Every year in the UK in the lead up to Easter, it’s a bit of a tradition (okay, it’s a BIG tradition) that the chocolate manufacturer Cadbury  do a number of innovative / intriguing and sometimes infuriating adverts for their Creme Egg product. The campaign of course is designed to raise awareness of the limited availability of Creme Eggs in the run up to Easter and will enrich and amplify the TV campaign that is currently running. 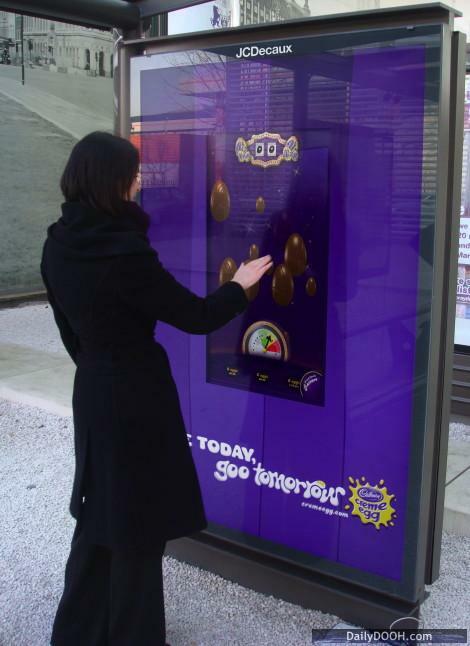 The out-of-home activity is also aiming to drive players to the website www.cremeegg.co.uk  where a selection of other games and interactive features, including online voting for the favourite TV ad, can be found. 1 Comment To "JCDecaux’s Goo The Egg"